CAFAM, or the Craft and Folk Art Museum, in Los Angeles, has marvelous public programs. 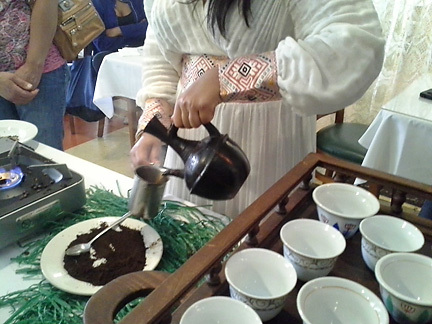 All over the city, interested participants can learn to build their own percussion instruments, help to create a one-hour radio segment, or, as we did recently, observe and savor a Traditional Ethiopian Coffee Ceremony. 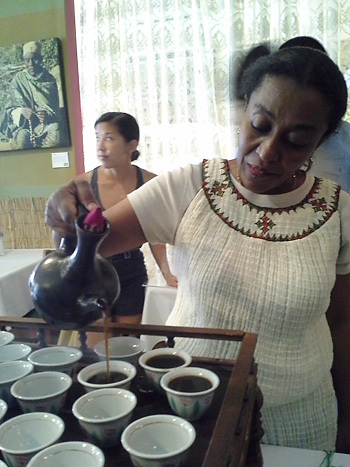 Held at the Little Ethiopian Restaurant, located in no other than the “Little Ethiopia” neighborhood of L.A., our adventure was kicked off by the owner sharing with us the concept and meaning of the traditional coffee-making ritual of his native Ethiopia. We were a varied, enthusiastic, and fascinated group, asking many questions, such as what was the significance of the popcorn displayed in bowls on the long table. Answer as I understood it: the popcorn represents the harvest. 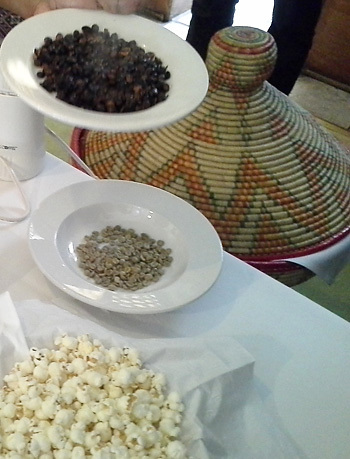 And, it is a fun and tasty little prelude to the freshly made coffee we were going to taste. The raw coffee beans are roasted. The popcorn is nibbled. 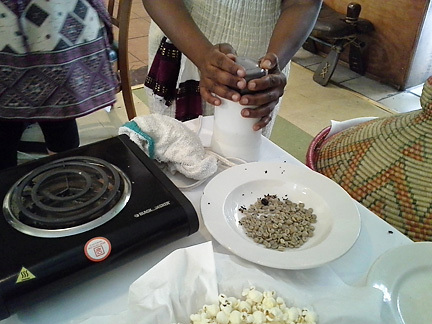 An electric burner substitutes for the traditional brazier, and modern coffee grinder for the more time-consuming mortar and pestle. Our lovely and friendly guide! The moment we have all been waiting for, (or I have, anyway!). Encouraged by the tantalizing fragrance, we are at last able to “wake up and smell the coffee”…and taste it too! I am here to tell you…it didn’t disappoint! 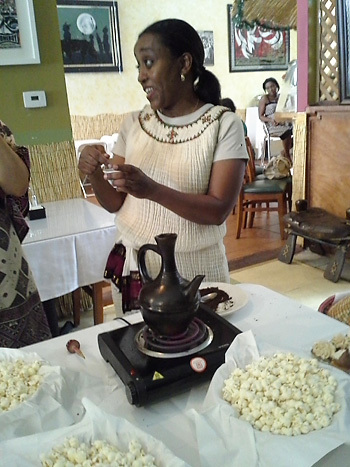 And neither did the delicious Ethiopian lunch we enjoyed afterwards. We needed some sustenance to go with our coffee, of course. 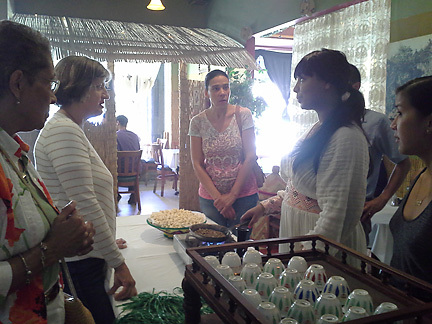 Learning about cuisine and culture, enjoying gastronomic delights, chatting with like-minded individuals…what’s not to love? 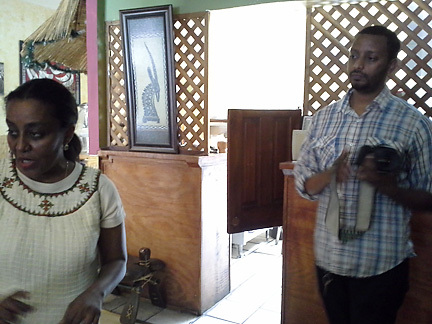 Many thanks to Mr. Sonny Abegaze, Project Manager, Folk Art Everywhere, A Project of the Craft and Folk Art Museum. 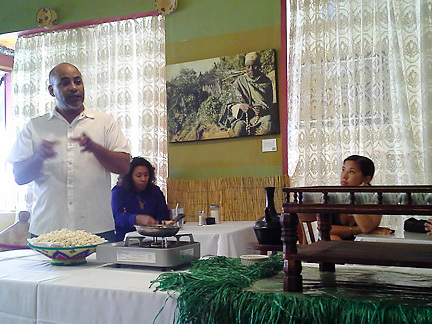 Another example of L.A.’s moveable feast. Don’t miss it. Folk Art IS Everywhere!